Authors: Vashchenko L.N., Gudtskova T.N., Nepomnyashchaya E.M., Karnaukhov N.S., Kvarchiya M.V. Aim. To evaluate the expression levels of Ki-67 and cyclin D1 and β-catenin in the subtypes of triple negative breast cancer. Methods. 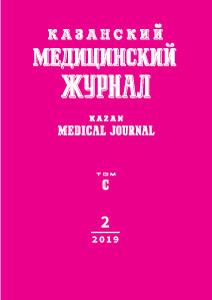 The study was conducted on the surgical material from 60 patients of clinical stage 2A (T1N1M0 or T2N0M0) who were treated at the Rostov Research Institute of Oncology from 2012 to 2015. For immunohistochemistry, antibodies to estrogen and progesterone receptors, cytokeratins 5/6, Ki-67, cyclin D1, β-catenin, HER2/neu and EGFR proteins were used. Results. Triple negative breast cancer with the signs of basal epithelium was found to have a significantly higher expression level of Ki-67 compared to non-basal-like one. In some part of triple negative breast cancer samples overexpression of cyclin D1 was observed. The high level of cyclin D1 in the basal-like subtype was less common than in the subtypes without the signs of basal epithelium, but its average value was significantly higher. In triple negative cancer with cyclin D1 overexpression, the loss of β-catenin on the cell membrane and its abnormal accumulation in the cytoplasm was significantly more frequent. β-catenin translocation into the cell nucleus was observed only in basal-like triple negative cancer, and 2 times more often in case of cyclin D1 overexpression. Conclusion. In triple negative breast cancer tumors with overexpression of cyclin D1 and abnormal expression of β-catenin are observed in some cases; these biomarkers can be considered as potential therapeutic targets for this group of tumors. Ki-67, triple negative breast cancer, basal-like triple negative breast cancer, Ki-67, cyclin D1, β-catenin. Yanjiao He, Zhaoxia Liu, Chao Qiao et al. Expression and significance of Wnt signaling components and their target genes in breast carcinoma. Molecular Med. Reports. Published online on: 2013: 137–143. doi: 10.3892/mmr.2013.1774. Zhuo W., Zhang L., Wang Y. et al. Cyclin D1 G870A polymorphism is a risk factor for esophageal cancer among Asians. Cancer Invest. 2012; 30 (9): 630–636. doi: 10.3109/07357907.2012.726385. Gayatri R., Anuradha A. Cyclin D1 expression in ductal carcinoma of the breast and its correlation with ­other prognostic parameters. J. Can. Res. Therap. 2014; 10 (3): 671–675. doi: 10.4103/0973-1482.138135. Pestell R.G. New roles of Cyclin D1. Am. J. Pathol. 2013; 183 (1): 3–9. doi: 10.1016/j.ajpath.2013.03.001. Mohammadizadeh F., Hani M., Ranaee M., Baghe­ri M. Role of cyclin D1 in breast carcinoma. J. Res. Med. Sci. 2013; 18 (12): 1021–1025. PMID: 24523791. Prosperi J.R., Goss K.H. A Wnt-ow of opportunity: targeting the Wnt/beta-catenin pathway in breast cancer. J. Curr. Drug. Targets. 2010; 11: 1074–1088. doi: 10.2174/138945010792006780. Xu J., Prosperi J.R., Choudhury N. et al. β-Catenin is required for the tumorigenic behavior of triple-negative breast cancer cells. PLoS One. 2015; 10 (2): e0117097. doi: 10.1371/journal.pone.0117097. © 2019 Vashchenko L.N., Gudtskova T.N., Nepomnyashchaya E.M., Karnaukhov N.S., Kvarchiya M.V.